Federal Judicial Nominee Who Has Never Tried A Case Advanced By Senate Committee : The Two-Way Brett Talley, 36, a Harvard Law School graduate, has worked for numerous political campaigns and written partisan blog posts but has limited experience as a practicing attorney. 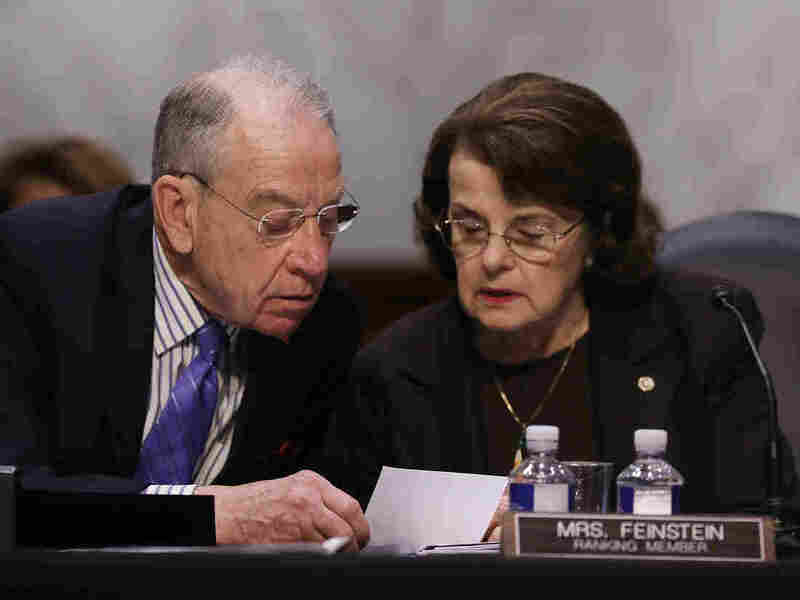 Senate Judiciary Committee Chairman Charles Grassley, R-Iowa, and ranking member Dianne Feinstein, D-Calif., participate in an executive business meeting in April. A party-line vote by the committee on Thursday advanced the judicial nomination of Brett Talley despite his lack of trial experience. Indeed, answering a questionnaire for judicial nominees, Talley stated, "I have not tried a case." The committee's partisan 11-9 vote on Thursday sends Talley and the other nominees to the full Senate for votes that are expected to break similarly along party lines. Before the Senate committee's meeting, the American Bar Association had unanimously deemed Talley "not qualified" for his nomination to preside over a federal court in Alabama. The group said in a separate letter that it "believes that Mr. Talley does not presently have the requisite trial experience or its equivalent." Last month, Feinstein highlighted Talley's credentials, stating, "You graduated from law school only ten years ago, and you have spent only a small portion of time since then practicing law." According to his LinkedIn page, following his graduation from Harvard Law School in 2007, he appears to have worked as a clerk, as the deputy solicitor general for the Alabama attorney general and as a writer for two prominent politicians: first, as a senior writer for former Gov. Mitt Romney's unsuccessful presidential campaign in 2012; and second, as a speechwriter for Sen. Rob Portman, R-Ohio, between 2013 and 2015. Talley's involvement in overtly political work appeared to arouse concern from some on the Senate Judiciary Committee about his ability to rule fairly over cases. Feinstein noted tweets in which Talley had referred to the 2016 Democratic nominee for president as "Hillary Rotten Clinton" and blog posts he authored that seemed to display a steadfast allegiance to gun rights advocates. A month after a gunman killed 20 children at the Sandy Hook Elementary School in Newtown, Conn., Talley described efforts by the Obama administration to advance gun control legislation as follows: "the President and his democratic allies in Congress are about to launch the greatest attack on our constitutional freedoms in our lifetime." One month later, as the national debate over gun control raged on, Talley responded to a reader's comment that "[w]e will have to resort to arms when our other rights--of speech, press, assembly, representative government--fail to yield the desired results," by writing, "I agree with this completely." When pressed by Feinstein about these statements and others, Talley reminded the committee that previous judicial nominees had managed to move beyond their polemical pasts to hear cases impartially and that he intended to "fully and faithfully comply with these obligations." Since 1989, the ABA has only unanimously voted to label four federal judge nominees "not qualified," and as NPR's Carrie Johnson reported, two of those have occurred in the first year of the Trump administration. While some liberal activists see this as a troubling trend, others argue the ABA's judgment is overvalued. "I'm very concerned about the ABA's procedure. It's not a neutral and nonpartisan process as it stands," Carrie Severino of the conservative Judicial Crisis Network told Johnson. In its letter, the ABA clarified that it "did not have any questions about Mr. Talley's integrity or temperament." Sen. Chuck Grassley, R-Iowa, the chairman of the Senate Judiciary Committee, said in a statement that he was not perturbed by the committee's approval of Talley in the face of the ABA's pronouncement. Grassley said the move was certainly not unprecedented, adding, "in fact, most nominees who have received this rating came out of Committee with a unanimous vote or by voice vote."